This autumn hundreds of student and graduate recruiters are visiting Cardiff University and their sole purpose is to meet students like you. What’s more there are staff from across Careers & Employability providing a wide range of specialist sessions to help support you whilst you are studying and beyond. There are a great range of services, support and events available to all students, to help you with all aspects of student & graduate recruitment and your career planning. 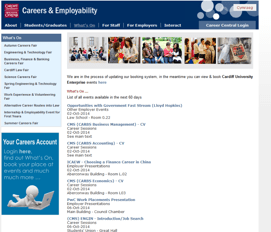 Check the Careers & Employability What’s On Feed, on the Careers & Employability Website, for all the latest listings of events. Follow us on Twitter for the latest news and events StudentlifeCU for all things related to Student Support and Wellbeing and Careers & Employability for student & graduate recruitment. Like us on Facebook StudentlifeCU for all things related to Student Support and Wellbeing and Careers & Employability for student & graduate recruitment. Whilst these media will give you the best overview of all that is on offer and the most up-to-date listings, there are specialist services, support and events directly related to Colleges. Autumn Careers Fair – If you aren’t sure what you want to do and are looking for ideas, this event is designed for all students and degree disciplines. It is a general career fair where you can meet student and graduate recruiters offering a wide range of recruitment and other opportunities. Business, Finance & Banking Careers Fair – Aimed at any students, from any degree discipline who want to find out more about the range of career paths available, training opportunities, work experience, graduate jobs or further study. Cardiff Law Fair – Aimed primarily at Law students but also any students from any degree discipline who are interested in a career in Law and want to find out more about training vacancies, work experience, graduate positions or further study. Although not directly related, organisations attending the Engineering & Technology Careers Fair may have opportunities in business related roles that may interest you. Careers Advice & Guidance – Find your Career Consultant availability and appointments online. Career Sessions in Academic Schools – Check the notice boards in your School. Employer Presentations, Events and Guest Lectures – Events will be held throughout the year, at Fairs, in Colleges and central locations – check What’s On and follow us on Twitter. Here are just some of the Graduate Recruiters targeting students in your College: Admiral Insurance, Army, BAE Systems, Bank of England, BDO LLP, Bloomberg, BT, Coca-Cola Enterprises, DCC, Enterprise Rent-A-Car, EY, Gist Limited, Grant Thornton, HMRC, HSBC, IBM, Imperial Tobacco Limited, Jaguar Land Rover, Marks & Spencer, Microsoft UK, Mondelez International, Nationwide Building Society, PwC, Redrow Homes, Royal Air Force, Teach First and Welsh Government / Civil Service Fast Stream. There are more – follow the web links above for Fair Exhibitor Listings and what’s On. Science Careers Fair – Aimed at students studying science related subjects, particularly Bioscience & Chemistry this event is a chance to find out more about the range of career paths available, training opportunities, work experience, graduate jobs or further study. Engineering & Technology Careers Fair – Aimed at students who would like a Career in Engineering, Physics or IT, with recruiters from these industries promoting placements and graduate positions avaialble to talk to you about your career interests and possibilities. Here are just some of the Graduate Recruiters targeting students in your College: Akzo Nobel, Biocatalysts Ltd, British Council, Civil Service Fast Stream, PwC, EY, Dow Corning, Fugro, Fulcrum Direct Ltd, GE Healthcare Cardiff, Johnson Matthey Plc, Mondelez International, Nationwide Building Society, Osiris Projects, Purolite Ltd, RSPB Cymru, SRK Consulting (UK) Ltd, Vectura Ltd. There are more – follow the weblinks above for Fair Exhibitor Lisitings and What’s On. Autumn Careers Fair – If you are’nt sure what you want to do and are looking for ideas, this event is designed for all students and degree disciplines. It is a general careers fair where you can meet student and graduate recruiters offering a wide range of recruitment and other opportunities. Engineering & Technology Careers Fair – Aimed at students who would like a Career in Engineering, Physics or IT, with recruiters from these industries promoting placements and graduate positions available to talk to you about your career interests and possibilities. Here are just some of the Graduate Recruiters targeting students in your College: AECOM, AnTech Ltd, Atkins, Babcock International Group Plc, Colas Rail, Dialog Semiconductor Ltd, Dyson Ltd, Intellectual Property Office, Jacobs, Jaguar Land Rover, IBM, Kier Group Plc, Lloyd’s Register, MBDA, Mott MacDonald, Network Rail , PwC, Deloitte, Civil Service Fast Stream, Raymond Brown Construction, Skanska, Renishaw Plc, Schlumberger, Tata Steel and VolkerFitzpatrick. 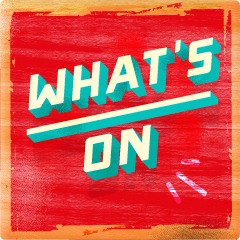 There are more – follow the web links above for Fair Exhibitor Listings and What’s On. We look forward to seeing you at our events this autumn and supporting you with your career planning.